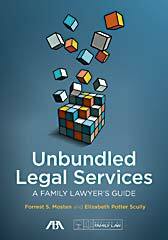 This book’s focus on family law practitioners is particularly appropriate given the unique promise that unbundling holds for family law litigants. In many jurisdictions, self-representation rates are highest in family cases. But, as any family law attorney (or family court litigant) knows, these are the case types that arguably benefit most from attorney involvement. Family issues are among the most sensitive and pressing matters that enter our civil justice system, and the outcomes of these cases can affect entire families for years to come. This important new book provides a crucial step forward in matching individuals with the family law services they need. Woody Mosten’s latest contribution to the delivery of legal services, co-authored with Elizabeth Potter Scully, is a “must have” for any lawyers who want to grow their family law practice to include limited scope legal services. Family law is uniquely suited to unbundling and Mosten and Scully have provided a practical and useful step by step guide to a wide range of applications which lend themselves to limited scope services. Their handbook is long on practice pointers and practical suggestions. 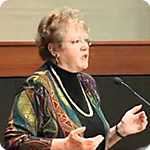 The material is well organized, easy to follow, and clearly addresses the various applications of limited scope to multiple aspects of family law practice, from document assistance, negotiation coaching, case management, limited scope court appearances and coaching of clients who are mediating their disputes. I highly recommend it as a first step for any lawyer considering adding limited scope legal services to their family law repertoire. The market for limited scope legal services is only going to grow, and smart lawyers are well advised to add this range of services to their family law practice in order to remain competitive. Pay particular attention to Chapter 12, which is an overview of the ethical and malpractice minefields of limited scope, and follow the excellent suggestions there carefully. The point of unbundling is to expand your legal practice and increase access to quality legal advice for those who might otherwise be unable to obtain it. While unbundling isn’t as dangerous as its detractors would have you believe, there are ethical and practical considerations which cannot be ignored. The ethical rules regarding unbundling vary widely from state to state. Even states which have adopted the ABA Model Rules sometimes interpret them differently. The authors have addressed this dilemma by focusing on the nuts and bolts of forming, managing, and growing a limited scope family law practice. While the authors have included a table of the relevant rules, be sure to go online and make sure you are complying with the most recent iteration of the rules in your jurisdiction. They change frequently. Actually, there’s a good (and lawyer-friendly) reason for that. As states adopt limited scope, they are often tentative, not sure how it will work, and cautious about protecting the public interest. They tend to start out with stricter rules until they see how it works in their state. As they find it works beautifully when done correctly, they tend to relax the rules to make it easier for lawyers to ethically and safely meet the growing consumer demand. Mosten and Scully have provided a broad smorgasbord of situations in which unbundling can be incorporated into a family law practice. Unbundled Legal Services is both an introduction to the application of limited scope to a family law practice, and a practical resource and reality check for the experienced family lawyer. Woody Mosten is a true pioneer in expanding the availability of affordable legal services. He invented unbundling, and this is a worthy next step in his impressive and growing legacy. This extraordinarily comprehensive guide to offering unbundled legal services to the primarily self-represented – who are now a majority of family litigants – offers a uniquely authoritative and practical source for every family lawyer. In the 17 years since he wrote his first ABA book on unbundling, Forrest Mosten has established himself as the creative energy behind the steady growth of unbundled legal services. In this new edition, Mosten and his co-author Elizabeth Potter Scully answer every possible practice question that both naifs and lawyers already accustomed to offering unbundling to clients could ask, including addressing often-voiced misconceptions about malpractice liability and disciplinary issues. In a sign of the unbundling movement’s maturity, Mosten and Scully integrate discussion of client vulnerabilities, disadvantages and sources of mistrust of lawyers and new knowledge about the access to justice crisis among family law clients. Mosten and Scully have written the Unbundling Bible. This book is a comprehensive guide for lawyers who want to offer unbundled legal services. Doing this is trickier than it sounds and it entails some ethical and malpractice pitfalls, described in chapter 12. So anyone providing these services would be well-advised to get this book. Mosten and Scully’s book offers a glimpse of the future and practical guidance for how to get there. As the authors note, “If you choose and can afford to operate your practice without unbundling, you probably will be able to do so for at least the next decade. However, just like many doctors in the 1930s opposed health insurance, today few doctors can practice without seeing patients covered by some form of health plan. It’s in the tea leaves. One of the most valuable aspects of the book is the clarity with which Mosten and Scully break down the practice of law into separable, discrete functions. Digesting their taxonomy of tasks, roles, and responsibilities, one can begin to cultivate the ability to differentiate and maintain boundaries, a skill critical for the limited scope lawyer. Limited scope practice, or unbundling, has also been referred to as “discrete task representation.” This suggests that both the lawyer and the client must be able to distinguish those tasks and roles and to recognize and respect the limits of the representa- tion. In negotiating the terms of the representation, the lawyer plays a critical role in educating the client about the various services he or she can provide and helping the client determine which tasks will be the client’s responsibility. Both must guard against “scope creep,” but the lawyer has a par- ticular obligation to do so. It starts innocently, with a call from the unbundled client on a busy afternoon asking a quick procedural or substantive question about an issue the client, not the attorney has agreed to handle. It’s an easy answer, the client is worried and the attorney knows she can quickly alleviate that worry, and it seems uptight, rigid or just too time consuming to explain that providing such information is beyond the lim- ited scope of the attorney’s representation and therefore before she can answer the question they will need an updated retainer agreement. “Just this once,” the attorney goes beyond the agreed upon scope, and the clearly drawn lines of demarcation begin to blur. Is Unbundling Right for You? Is Collaborative Law Appropriate for Your Client? 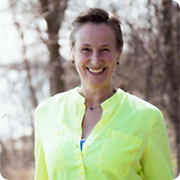 Learn more about Woody’s legal coaching services and listen to podcasts with on unbundling with Julie MacFarlane (author of The New Lawyer) and others.